Classic Direct Drive Turntable from Denon. no longer in production. Just to correct pmurphy's comment below, the DP-60L and M were actually produced well before the DP-59L and M. The DP-60 series were launched in 1980 compared to 1984 for the 59 series. In terms of level, they were both similar and neither was the top or bottom of their line of turntables. 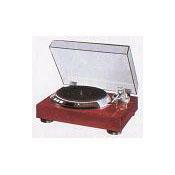 The 59M and L came in a heavier plinth and had an electronically controlled tonearm (similar to the 57 series). In terms of performance, there is little to choose between them but I prefer the appearance of the 60 series and the lower risk of failure associated with a non-electronic tonearm. Either way, both exceptional turntables and would kick most of today's sub-$2k turntables to the kerb. I own a Linn Axis with Sumiko Pearl cartridge, a Duel 505-2 with an Ortofon 5e cartridge and i recently purchased a Denon DP60L on which i put an Ortofon 2M Red cartridge. The Duel is what i listen to a lot . Then when i want to treat myself i play either the Linn or the Denon, depending on what music i am in the mood for. I must admit, the Denon is steeling my heart over my Linn. It looks the part and it sounds amazing. I love this turntable. Actually the DP 60l was produced after the DP 59l. The 59l was the top of the line 50 series and the 60l was the bottom of the line 60 series. I once bought a DP60L to replace a Dual 721 and owned it for several years. armpipes with different effective masses. definitly better than my former 721 but it has surely more "hifi-gloria". not like that anymore and cheap plastic crap took over long ago. Lighter than expected platter (not a weakness to me but might be to some). Quality is the word that best describes the DP 60L. Manufactured in 1980, my DP 60L looks and runs as if it just came out of the box. Cosmetically, the unit is a visual showpiece. The dustcover is sturdy with adjustable tenion hinges. The case is solid wood with a glossy rosewood veneer finish. Mechanically, you will be hard pressed to find a machine that treats your records and your ears as well. The DP 60L is loaded with fine tuning adjustments to enhance your listening experience. Other than the usual anti-skate and stylus pressure adjustments, you can also adjust arm height, arm lift height, lead out adjustment and interchange straight for "S" style tonearms. The platter could be a little heaviier, however, the sheer weight of the entire unit (33LBS) coupled with a dead quiet, quartz locked motor provide for very low "wow and Flutter" and vibration specs. This is a fully manual table which is best for minimizing record and stylus wear which means there are no mechanics (motor) connected to the horizontal movement of the tonearm. A peave of mine regarding manual tables is that you have to manually lift the arm off the record when it finishes. Not so with the DP 60L. The system employs a contactless arm lift and shutoff system when the record ends. This is done through the use of a sensor which can be adjusted if necesary with "lead out" adjustment screw. As the system comes with 2 tone arms, it allows you to experiment more freely with different cartridges to further enhance your listening experience. Currently, I am using a Denon DL110 in the straight arm and a Grado Silver cartridge in the "S" shaped arm. These units are becoming more and hard to find but if you keep an eye out on E-bay, one will eventually turn up so get ready to place your bid. Overall this turntable will satisfy the tastes of most analogue audiophile enthusiasts. I personally could not be more satisfied. "Quality" is the first word that comes to mind in describing this machine. I've owned many turntables in the past but nothing that compares with the DP 60L Aside from it's astounding beautiful looks, it is a high end precision record player and would recommend for anyone who wants the best for thier records. This TT is fully manual with a very unique shut off system. When the needle reaches the end of the record, it is gently raised off the record and the platter stops spinning. This action is engaged by a "contactless" sensor system that eliminates any mechanical intervention with the horizontal movement of the tonearm at the end of the record, thus eliminating any unwanted forces on the sylus and record. It comes with a straight tube arm and "s" shaped arm which are easily interchangeable. I am using a Denon DL-110 cartridge in the straight and a Grado Silver cartridge in the "s" shaped arm. I am finding that my music enjoyment is enhanced with the ability to switch from one to the other as each cartridge defines the music being played a little differently. If you are like me and are into lots of fine tuning, this table has many possible adjustments. Besides the usual counterweight and anti- skate adjustments, the DP 60L also has a tonearm height adjustment, an arm lift height adjustment, a "lead out" adjustment, and an adjustment on the actual counterweight that allows you to use cartridges of various weights. These tables are hard to come by as they were manufactured in 1980. I was fortunate enough to get one in pretty much mint condition including a very clean, clear dust cover. You will see them from time to time on E Bay so do yourself a favour and put in your bid. This is truly a top quality player. - screws of arm-bearing become too tight after 25 years, you have to loosen them a little bit, but be gentle with the arm! - fixed interlink cable, difficult to replace it. - the non-removable straight-arm does not reveal the quality of very expensive phono cartridges, cartridges up to 300 US$ are perfect. - I think that the motor is less strong than the motor of the denon dp-57. I got 3 of these Denon dp-60L direct-drive tables, indicating that I like them. I also have belt-drive high-end tables, but these Denons are my workhorses and are functioning without troubles and don't need frequent adjustments of tone-arm settings. This is a nice direct drive turntable, without any motor noise. It does not harm your vinyl because the arm goes very gentle downward and upward. Stable speed, which can be checked via a built-in stroboscope light. Different from the later Denon dp models like the dp-62 and dp-67, this dp-60 has a metal ufo-like ring and a more vintage-like tone-arm (no biotracer tone-arm). Also the plinth is better than the plinth of a dp-57/62/67. However, the platter has somewhat lower mass than the platter of the dp-57. The straight arm-tube likes phono-cartridges playing with approx. 1.2 grams tracking-force, but tracking forces up to 1.9 grams are OK. This is a great machine, sounds OK and is the last Denon turntable with vintage looks (stroboscope). Note that using 300+ costing US$ phono cartridges is not needed, using a denon dl-160 cartridge or better, a dl-303 or dl-301 is ideal.